Hello SPI Media – Please see our short release below explaining who we are and our unique approach to solar thermal. Looking forward to your questions at the show (booth 1041) or by email! Central Coast California solar technology firm LightManufacturing exhibits at the Solar Power International (SPI) expo in Anaheim this week, showing new applications for solar energy and a unique set of products at the conference. “We’re not a PV company” explains founder Karl von Kries, “we don’t make electricity. Instead, we use concentrated solar heat to replace fossil fuels in industry”. Continues von Kries, “For example, we’ve learned how to mold water tanks and boats using solar thermal energy at a fraction of the cost”. The company has molded thousands of commercial-grade plastic parts for private clients at its research facility. The firm’s Solar Rotational Molding or SRM™ process recently received US Patent protection. The company is targeting several follow-on industrial processes for conversion to real-time solar heat. In addition to patents and process know–how, the firm developed a unique line of sun-tracking heliostats. A two–year effort yielded a simple, industrial–grade heliostat that’s efficient to deploy in small arrays. “The new H1 is remarkably easy to use”, says von Kries, “and it’s the first ‘Internet of Things’ or IoT heliostat”. 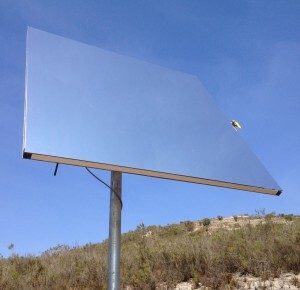 According to the company, the H1 is the first heliostat that connects to the Internet for simple cloud-based configuration and aiming. No software is required to use the H1, just a web browser on a computer or smartphone. LightManufacturing’s unique vision for industrial solar thermal industry won the firm a slot at the competitive “Start-Up Alley” section of the massive Solar Power International show, and landed the company a chance to present at the the even–more–selective Startup Challenge competition. SPI attracts 20,000 visitors and 600 exhibitors each year, so “we’re very excited to participate”, says von Kries. Founded in 2010, LightManufacturing researches and commercializes solar thermal technology, including Solar Vacuum-Forming and Solar Rotational Molding (SRM®). The firm’s products include the H1 heliostat and turn-key SRM molding systems.